Gabe Guzman slides to the safety of third base as the Harvesters shut out the Mountain View Lions 11-0 on Feb. 24. Photo by Andrew Gonzales/The Et Cetera. The Harvesters baseball team opened conference play last week with a series sweep of Mountain View, outscoring the Lions 33-2, but followed that up with a 2-1 series loss to Cedar Valley. 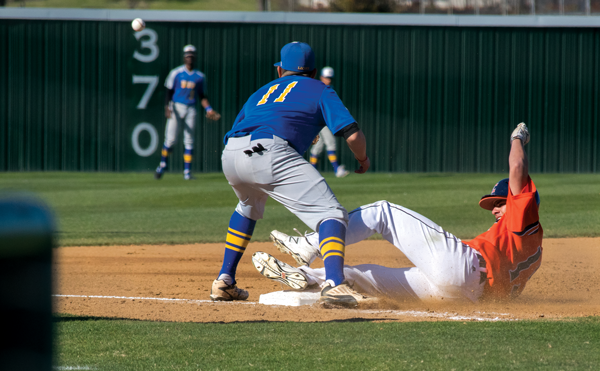 Eastfield, 10-9 overall and 4-2 in conference coming out of the weekend, has scored 156 runs in its 19 games, which ranks second in the nation. Pitcher Paul Bowman (3-1) was dominant through 7 1/3 innings, allowing only two hits while striking out 10 of the 26 batters he faced in the Feb. 22 Dalton Acosta closed out the game, earning his first save of the season. Tanner Foy scored two of Eastfield’s three runs, and Will Crooker and Blake Seagraves drove in one run each. Mich Tamez (2-1) tossed a two-hit shutout over seven innings and walked only one in a dominant performance. Eastfield’s bats came alive early, scoring six runs in the first two innings and adding five more in the sixth. Gabe Guzman went 2-for-4 with a triple, two runs, three RBI and a stolen base to pace the Harvesters. Logan Montoya was 3-for-4 with a triple, an RBI and three runs scored, and Foy was 1-for-3 with a triple, three RBI and a run scored. The Harvesters’ offense picked up where it left off in the previous game, scoring seven runs in the third inning and never looking back. Foy led the way, going 3-for-4 at the plate with a home run and a triple, driving in four runs and scoring four more. Guzman also went 3-for-5 with a triple, four RBI and three runs, while Blake Seagraves and Jordan Parker contributed three RBI each. Eastfield saw its 7-6 advantage slip away in the ninth as the Suns scored two runs off reliever Daniel Acosta and took the win the March 1 series opener in walk-off fashion. Skylar Black went 3-for-3 with a double and three RBI to key the Harvesters’ offense and Guzman was 3-for-5 with a RBI, scoring a run. The Harvesters bounced back from their loss in the previous run by scoring six runs in the first three innings. Montoya led a balanced offensive attack, going 2-for-4 with a home run, three RBI and two runs scored. Foy also homered, and Blake Seagraves added two hits and two RBI. Mich Tamez (3-1) struck out eight batters and gave up two runs on five hits in 5 1/3 innings to earn the win. Starter Cody Johnson (1-2) was unable to get out of the first inning, giving up three walks and four hits as the Suns quickly scored the game’s first five runs. Acosta (1-1) didn’t fare much better, allowing five runs ­— only one of them earned — on five hits and three walks over the next 3 1/3 innings. Guzman went 3-for-4 with a triple, a RBI and a run scored for the Harvesters, while Crooker went 2-for-3. Jay Milton slides back to first after nearly getting caught stealing a base versus Mountain View on Feb. 24. Photo by Andrew Gonzales/The Et Cetera. First basemen Tanner Foy just misses the putout against Mountain View on Feb. 24. Photo by Andrew Gonzales/The Et Cetera. Patrick Bannister pitched for 4 innings against Texas Wesleyan as the Harvesters won 9-0 on Feb. 27. Photo by Yesenia Alvarado/The Et Cetera. Jordan Parker at bat for the Harvesters against Texas Wesleyan on Feb. 27. Photo by Yesenia Alvarado/The Et Cetera.